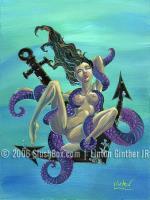 The maiden of the sea that pulls you to the black abyss. Archive Quality 9 x 12 Giclee. Limited to 200 units, signed and numbered.